No, I don’t have a recipe for upside pizza. That’s just what we jokingly called the piping hot homemade pizza that slid off of my pizza stone and flipped over onto the oven rack Saturday night. Eric ran in from the living room, then we grabbed potholders and somehow managed to flip the whole rack over to get the pizza back onto the stone (with only minor burns to our arms and fingers). It still tasted delicious, and I think our newest exchange student (who helped make the pizza on his first night with us) was entertained to see how unfazed we were by the near disaster. I know sometimes the blog can make it look like I have it all together in the kitchen, but I assure you, that is not the case! Just wanted to share the evidence with you so that next time you have a kitchen mishap, you know you’re not alone. Actually, I’d love to be encouraged to know I’m not alone! 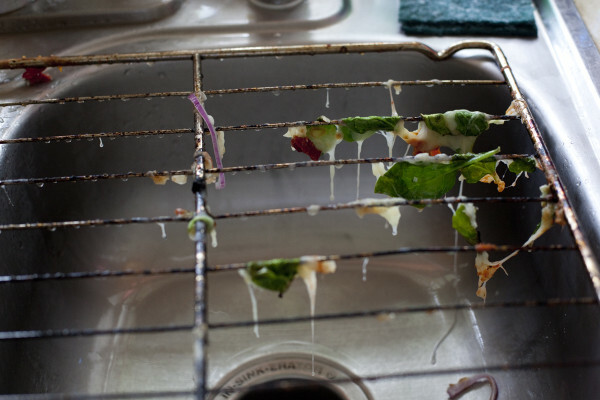 Have you had any disasters or near disasters in the kitchen lately? Do tell! I had a pot of quinoa on high instead of simmer and couldn’t figure out what was burning until I took it off the burner and started to dish it up and there was a thick crust of charred nastiness on the bottom of the pot! I’m glad I caught it in time! The first time I made Thanksgiving dinner for my family, I was “in the weeds” as they say. I had too much going on at once. I was frantically mashing potatoes, peeling pearl onions and cleaning greenbeans while fluidly talking to myself the night before the big day. All of a sudden I started wailing and swearing. I had realized too late that instead of the cream, I added pumpkin egg nog to the mashed potatoes. They were both orange cartons. Luckily I only added a tablespoon. I still served the mashed potatoes and ironically got the most compliments on them. Sometimes mistakes are accidental inventions! I would have to say my most common kitchen disaster is that for some strange reason I’ve never bought a toaster so I routinely make toast under the broiler. And without fail it takes me a good 2-3 attempts becaus I consistently forget about the bread only to come back to something ridiculously charred. Having a meal that you’ve worked so hard on ruined is always a bummer, but it does provide moments of laughter and will be something you’ll probably never forget! I’ve been experimenting with foraged stinging nettles. Supposedly you can substitute them for any recipes that calls for spinach. A few weeks ago I made delicious nettle pesto. So I decided to try nettle mushroom lasagna. Earlier this week I harvested some fresh nettles and made the lasagna. It was so bitter we could hardly choke any down. By next morning just the smell of that lasagna made us gag. I had to throw the rest of it out. I suppose the dry weather last month made them bitter. What a waste of good cheese and mushrooms. I’ll try cooking with nettles again next spring, but I’ll always test them before including them in a recipe.